ColorFabb XT-CF20 is a copolyester based carbon fiber composite material that is based on the Amphora 3D polymer from Eastman Chemical and is loaded with no less than 20% specially sourced carbon fibers suitable for 3D Printing. 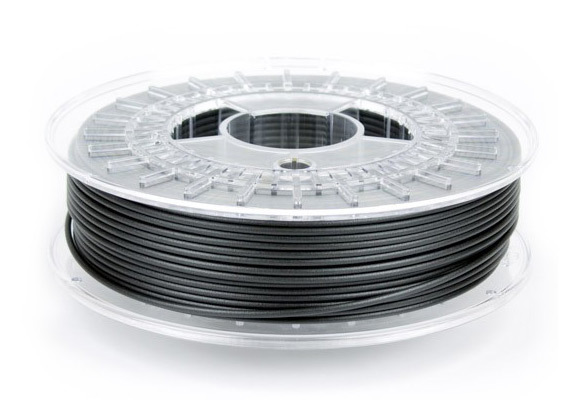 The XT-CF20 filament uses the XT-Copolyester instead of the PLA/PHA from COlorFabb and the result is a filament with higher strength and toughness as well as resistance to higher temperatures before starting to get soft. The not so good thing compared to PLA/PHA is that a heated build plate is recommended for using the XT-Copolyester for your prints to stick better, although you could end up getting good results on 3D printers without a HBP as well. The combination of XT-Copolyester with 20% of carbon fibers in the ColorFabb XT-CF20 is very good and prints using this filament, we have previously tested carbon fiber-based filaments with PLA such as Proto Pasta’s Carbon Fiber PLA, but the XT-CF20 does seem to do better job. The XT-CF20 does seem to be less brittle and a bit more stiffer with a better resistance to higher temperatures thanks to the 80 degrees Celsius glass transition temperature. 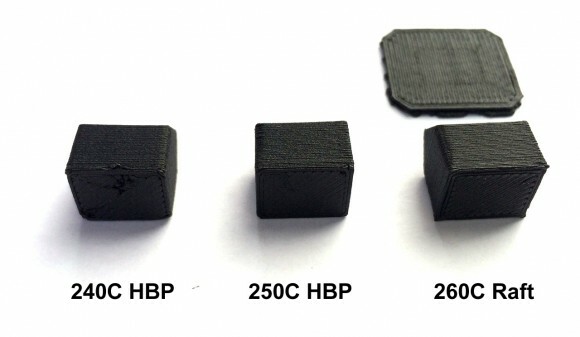 The carbon fiber-based solution from ColorFabb also does seem to contain a bit more carbon fibers – 20% as opposed to just 15% in the Carbon Fiber PLA that we have previously tested. ColorFabb XT-CF20 does require higher printing temperature with 240-260C recommended, it is recommended to be printed using 40-70 mm/s speed and a heated build plate (if available) is recommended at 60-70C. Also do note that carbon fiber filament is more abrasive than standard filament, so it can shorten the life of standard brass nozzles by increasing the wear level. So it is recommended to use a printing nozzle with some sort of coating such as the ones we have tested from Performance 3-d or AVN Swiss. We have tested printing with the ColorFabb XT-CF20 carbon fiber filament on our trustworthy MakerBot Replicator 2 3D printer with some useful upgrades such as a coated nozzle and added HBP, so we had not trouble or worries using the XT-CF20 filament. The first test was to try and print using the carbon fiber filament on a cold build plate, we’ve already had some experience using the XT-Copolyerster filament using the ColorFabb XT Transparent Filament earlier this year before upgrading the 3D printer with a heated build platform. Interestingly enough the XT-CF20 carbon fiber filament does seem to print easier and to stick better than the XT transparent filament probably due to the carbon fibers. All we’ve had to do was to enable the use of rafts and we got a great quality print on our first try at 240 degrees Celsius printing temperature and going to 260C did not make much difference. We were able to print smaller parts at 90 mm/s printing speed at 0.2 mm layer height without any trouble, though you would probably want to reduce the speed a bit for finer details. Also no trobule removing the raft from the actual model and getting a good quality base of the part that was 3D printer on the raft. Next was to test the ColorFabb XT-CF20 carbon fiber filament using the heated build plate at the recommended settings and see how things will go without having to use a raft when printing. We have started with 240C extruder temperature and tried with both 60C and 70C temperature of the HBP, but with both we’ve had trouble with the base of the 3D printer part to stick properly on the build plate. Moving to 250 degrees Celsius for the extruder we had the part sticking better and remaining on the build plate, but the base of printer part has shown that it still did not stick perfectly at either 60C or 70C HBP temperature. Going to 260C for the extruder and we got the filament sticking well at either 60-70C temperature for the heated build plate. The only problem that remains and that is associated with the high extrusion temperature is that the filament oozes from the nozzle a bit more when the printing head moves over longer distances to continue printing for larger objects. Other than that, with the right settings the ColorFabb XT-CF20 carbon fiber filament does seem quite easy to work with and provides good results, now we only need to print some parts that would be stress tested like something for an RC model.